If spring lawn care is about getting your lawn healthy and green, summer is about KEEPING it healthy while temperatures soar and rainfall becomes a fleeting memory. Here are some tips for keeping your lawn in shape over those long, hot days of summer. After the spring growing season, summer brings quite a bit of stress to your lawn. 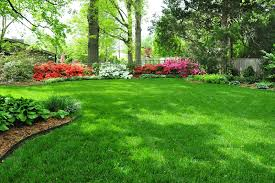 We want our lawns lush and green for outdoor activities, and we try to fight nature by continuing to fertilize, water, and coax new growth out of our lawns no matter what the weather. However, by understanding and respecting the seasonal changes of turf grasses, you can take steps to care gently for your lawn as the mercury rises. Once temperatures get into the 80s and above, lawns will begin to struggle a little. Growth will slow, color may fade, and lawns will show signs of wear and tear as they are less able to recover from stress and traffic. Lawns need at least one inch of water per week, and more when the heat is severe. 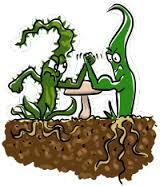 Water deeply and less frequently to encourage drought-tolerant roots. Water early in the day to reduce evaporation and fungal growth. Either water your lawn regularly and deeply, or donâ€™t water at all. Donâ€™t let your lawn go brown and dormant, then try to â€œwater it back to life.â€ If your lawn goes dormant in summer, it should stay that way until fall â€“ donâ€™t worry, it should recover once the weather changes. Raise your mower blade in the summer. Taller grass is more drought-tolerant, grows deeper roots, and helps shade the earth to prevent weed seeds from germinating. Mulching grass clippings helps keep moisture levels steady. Mow regularly, to prevent cutting more than 1/3 of the grass blade at a time. This keeps your grass healthier and prevents the clippings from smothering the grass. Keep mower blades sharp. Make sure your mower is cutting your grass, not tearing it, to minimize stress during hot temperatures. If your lawn is looking straggly in midsummer, resist the urge to fertilize. In fact, itâ€™s best to stop fertilizing about 30 days before summer temperatures arrive. Applying extra fertilizer in the heat of summer can burn your lawn and create a flush of tender growth that will struggle in the hot summer weather. Never fertilize dormant lawns â€“ wait until they green up in the fall. By summer, many lawns begin to show signs of wear, especially in a few popular pathways. Consider installing stepping stones to minimize damage to your grass, and try to minimize traffic on dormant, brittle lawns. If youâ€™re getting plenty of rainfall and your lawn is actively growing, you can apply a bit of fertilizer to these areas to help the blades recover faster. Summer is the season to get those growing weeds removed before they bloom and disperse seed for next year. Targeted postemergent herbicides are designed to kill broadleaf weeds without harming turf grass, but they must be applied when temperatures will be below 85Â° F for a few days. Keep in mind that during the heat of summer, ANY product can be damaging to already-stressed lawn grasses, so use sparingly or hand-pull weeds instead. Dormant or drought-stressed summer lawns can be more susceptible to insect infestations, such as chinch bugs, cutworms, armyworms, sod webworms, fire ants, fleas, and mosquitoes. Summer is also the time for fungal diseases, such as powdery mildew and brown patch. Apply fungicide if needed, and avoid watering in the evening to keep nighttime moisture at a minimum. Grubs will begin hatching in your lawn over the summer. If grubs typically cause problems in your lawn, you can begin applying grub control around midsummer. Can Greener Grass translate into more "Green" in Your Pocket? Call and Let's Chat.